Just in time for our very first headline UK tour, we’ve decided to release our cover version of legendary Queen’s "The Prophet’s Song" digitally — a befitting tribute (we hope) to the incredible rock music legacy of Britain, and a mighty epic and mysterious tune! The beautiful cover art for the single was created by immensely talented Celtic Botan from Brazil! We shall buy her a Caipirinha or two when we head over there in May. Check out her other work at http://instagram.com/celticbotan! WE ARE COMING TO BRAZIL! 🇧🇷 Brazil! Making this happen within the first year of our #ThisIsTheSound tour has been at the top of our wish list right from the start. And we just about managed! We will be joining the mighty Therion this coming May in Belo Horizonte, Rio De Janeiro and São Paulo, and we cannot wait to see you all there. It’s been way too long! IRELAND & UK TOUR ANNOUNCED! We are beyond excited to announce our first headline tour visiting Ireland, Scotland and England! These are some of the most beautiful places in the world, and we feel a special connection to each of them. Ireland is Anna’s second homeland, and Merlin’s year is never complete without his pilgrimage to the highlands and Isles - that’s where they produce our favourite drink too! And of course Britain is home to some of the most important places in rock music history. It is about time that we bring our music over for an extended visit, after the incredible welcome we received at our first show in London last year! We are also very much looking forward to sharing the stage with none other than DIAMOND BLACK, the brand new band founded by Ben Christo (Sisters Of Mercy)! Check out their fantastic new single here: https://youtu.be/0DD0WJR7ri4. “Crushing riffs, mesmerizing electronica & cinematic choruses, telling tales of desire, decadence & devotion” - sounds just about right. These will be some truly magical nights - we can’t wait to rock out with you all! 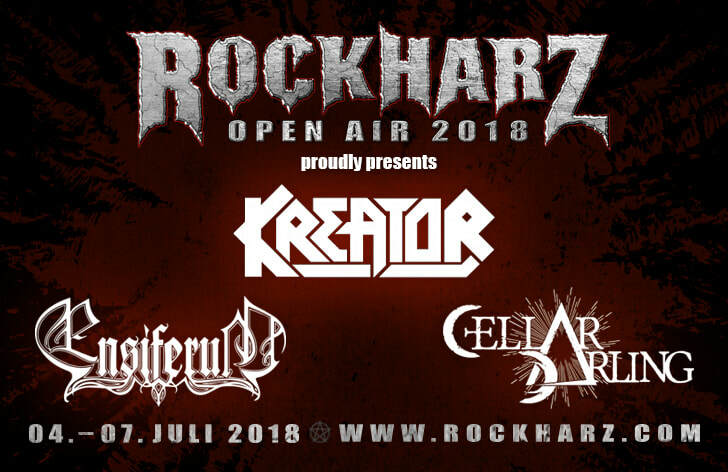 CELLAR DARLING @ ROCKHARZ OPEN AIR! 🎫 Tickets gibt es unter http://www.rockharz-festival.com - holt euch eures rechtzeitig! With the start of the new year, we have officially begun recording our very first album at Tommy Vetterli's New Sound Studio. Creativity is flowing, spirits are high, and we could not be happier with the results so far! We cannot wait to share this with you. The album will be out this summer on Nuclear Blast records. What an amazing year, thanks for all your support and most of all - thanks for listening! We are excited to be part of next year’s edition of Download Festival France! Come rock out with us and an incredible line-up of amazing bands! We are excited to play the excellent Durbuy Rock Festival next year! Don’t miss our show on Saturday, April 7th! ProgPower USA: Tickets on sale now! We cannot wait to finally head to America next year, to perform at the legendary ProgPower USA! Tickets are on sale NOW - in fact, we hear they’re almost sold out already, so get yours early!! This will be one amazing festival - see you there! FINALLY AVAILABLE ONLINE - THE BEST SELLER FROM OUR CURRENT TOUR! Yet another beautiful design created by Costin Chioreanu! This time, we asked Costin to listen to the song and let his art be inspired by the lyrics, without any guidance from us. We absolutely love the result! Available in all sizes from Small to 3X-Large - ships worldwide! Thank you for your support! It‘s the sixth of November. A good day to present you with the video to our song „Six Days“, a dark and abstract story about the last man left on earth. We‘ve always wanted this special song to have a visual representation and we knew immediately that if we ever could realise the project the man for it would be our favourite artist Costin Chioreanu. Without any guidelines he has managed to capture the atmosphere perfectly, the video really shows what was inside Anna’s head when she wrote the lyrics and recorded the first demo in the middle of the night. When we further worked on this song we realised once more that we are not really bound to one style of music and that we have the freedom to expand our horizon even more - that‘s why this song will always have a special meaning to us. We hope you love it as much as we do! Paris! 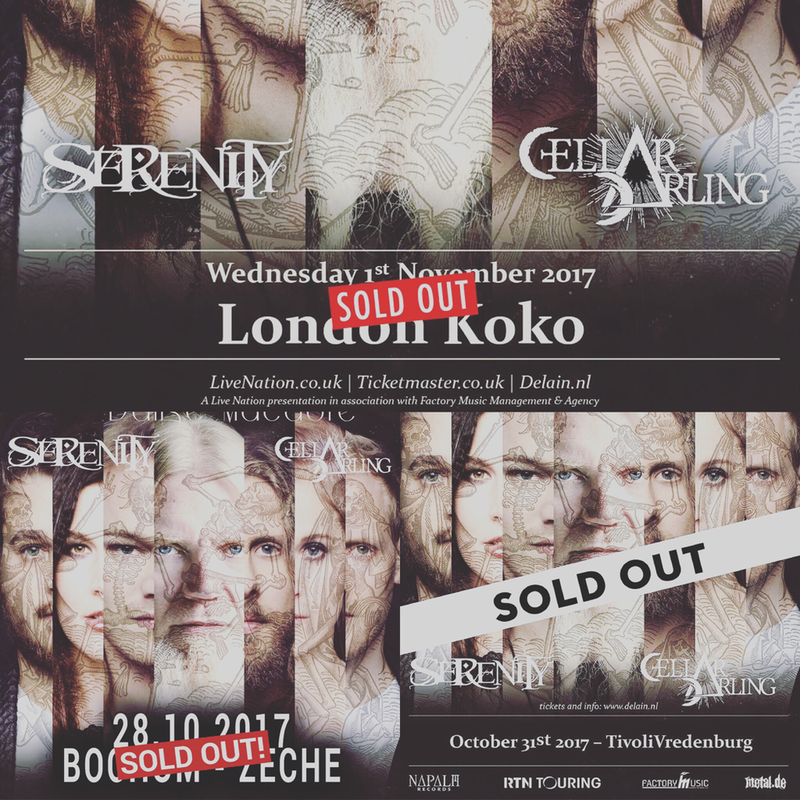 Yet another show on our upcoming tour with the incredible Delain is sold out. We cannot wait to rock out with you all!! Tickets remain for only two shows on this very special run: Pratteln, Switzerland (tickets: http://bit.ly/2z8CLKf) and Munich, Germany (tickets: http://bit.ly/2xHVsrE). Get your tickets in time! Check our tour dates for all upcoming shows!